The Violin Shop: Bach's Six Suites. For Cello? Or Something Else? Bach's Six Suites. For Cello? Or Something Else? Bach's 'Six Suites' are the Holy Grail of Unaccompanied Pieces for Cello. They have been transcribed for multiple instruments including violin and viola. Cellists often sneer at violists who perform these works. However, historical evidence suggests that these violists might not be as far off as cellists might think. What if the works were really written for a type of viola and they've been transcribed for cello??? Oh, the horrors! 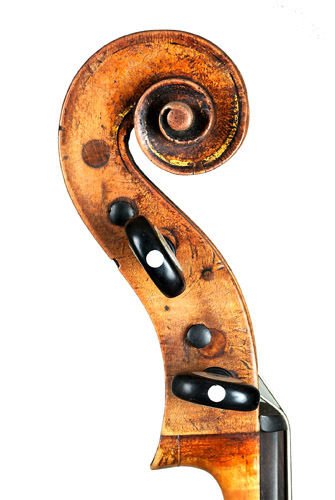 On the 'King' Amati cello scroll above, notice the dark circle above the D peg. That's probably where a fifth peg was located. The peg hole has since been bushed. Originally (circa 1538), the cello was probably made as a three string cello, later turned into a five string, and finally a four string. 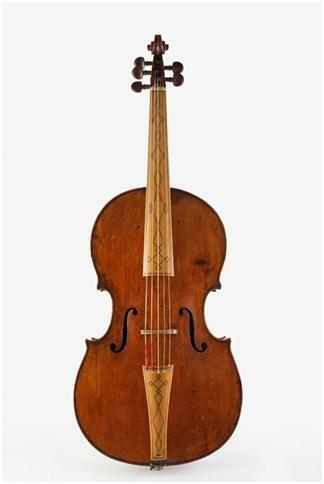 During Bach's time, the string instrument family was much larger than it is today and not even remotely standardized. String instruments went in and out of fashion so quickly that today we are sometimes left scratching our heads as to which instrument the composer intended to be used. This just happens to be the dilemma surrounding the Bach Cello Suites. As many cellists will attest, there is a disconnect in the level of difficulty between the first four suites and the fifth and sixth suites. This may be due to the fact that they written for a five stringed instrument (tuned from high to low E,A,D,G,C or a different scordatura tuning) known as the vioincello piccolo or it's nickname 'viola pomposa' or just a somewhat smaller bodied (about the size of a modern 7/8 cello) five string cello. It has been conjectured in many sources that J.S. 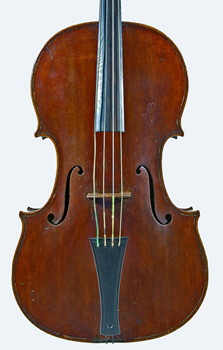 Bach was the inventor of the viola pomposa. It is more likely that Bach acted as a consultant during invention of the instrument rather than him being the sole inventor. This instrument would have been held on the shoulder, or balanced against the chest, by the performer and many sources suggest that Bach preferred this instrument to bring out the bass line. But what does this have to do with the Bach Cello Suites? So what if the Fifth and Sixth Suites are way more difficult than the other Suites? In 50 years time, composers would be pushing the difficulty of the standard cello repertoire to that level. Perhaps Bach was just a trend setter for the cello. The Anna Magdalena Bach (Bach's second and surviving wife) manuscript suggests otherwise. In her manuscript she indicates the tuning of the strings of the instrument for the Sixth Suite which is (from low to high) C-G-D-A-E. This confirms that this particular suite was probably composed not for a four string cello, but a five stringed instrument. In the above video, Lawrence Lesser talks about his beautiful Amati cello. Pause the video at about 1:20. Look closely above the D peg and you'll see a circular pattern where a fifth peg hole probably used to be. It has since been filled with a 'bushing'. Even with this fifth string, what argument could be made for the Bach Viola suites? It was not uncommon at this time in Bach's circle for the violincello piccolo and the viola pomposa to be held on the shoulder more often than between the player's legs. Bach played shoulder stringed instruments so it would be more likely that he would write these pieces for a bass instrument played on the shoulder such as the viola pomposa. 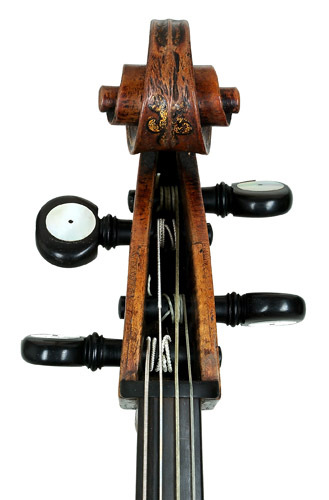 Note the circular outline above the D peg in this Italian cello from the 1790s. Evidence of the probability that this small model cello was once a five string cello. Steven Isserlis has a wonderful recording of the 'Bach Cello Suites'. He's obviously done quite a bit of research and musical reflection on how they are played and for what instrument they were written. He feels the most likely candidates for instruments for the Sixth suite would have been a violincello piccolo or a five string cello. But he concludes "all six suites for cello really are for cello"! Steven Isserlis also writes about practicing playing a five string cello for the Sixth Suite but recorded the suite with a standard four string cello. Interestingly, he used his Guadagnini cello in scordatura tuning for the Fifth Suite and his Stradivarius cello for the first Four Suites. Unfortunately, he doesn't tell us which cello he used for the Sixth. Does it matter which instrument Bach wrote the 'Suites' for? I think not! Bach seemed very much in favor of transcribing his pieces for whatever instruments were on hand. 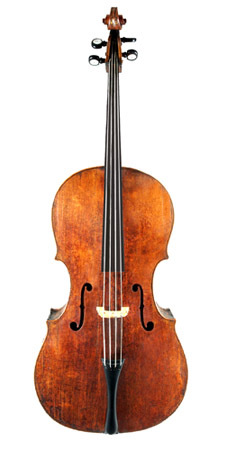 Does it matter whether it was a cello built to modern standards, a small cello, a large viola, or a five string cello? Again, I think not! Why are five string cellos, viola pomposas, and violincello piccolos not being played today? Simply put- They don't sound nearly as nice as a full size four string cello. Time and tastes in music have marched on since Bach's time and the cello family has evolved as well. For our modern sensibilities in terms of tonal production, clarity, fullness, and response, the standard sized four string cello does an excellent job! Need more reading? a research paper on five string cellos, originally published by 'The Japan society for the Promotion of Science. 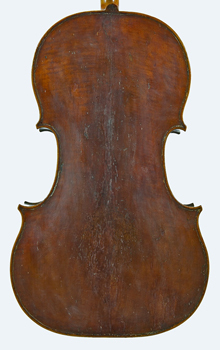 Also, Jason Price has written an excellent couple of articles on early cellos and cello making. Are you a Cellist or interested in becoming one? Take a look at our Fine Cellos! Please, are the available CD records of Bach 6th Suite with five-string instrument ?